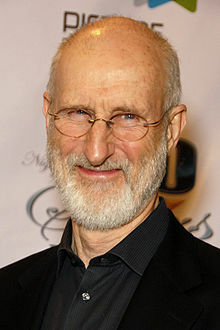 Hollywood actor, James Cromwell, predicted that there would be blood in the streets if Democrats didn't win the upcoming election. Cromwell (who continually threatens to leave the US if Republicans win, but never had the guts to get out of town) seems to forget who has the guns, and it's not the progs. I find that interesting. Whose blood is he referring to? It would be interesting to have the actor (and who really cares what an actor says when he's not reading what somebody else wrote for him?) elaborate on his statement. Many conservatives, who are tired of left wing bullying, would tell Cromwell, "bring it". The liberal thugs like Black Lives Matter and Antifa have never met a group of angry, armed veterans. And if they had, they'd find that they need to find more angry black people and Antifa activists... and more Illegal Aliens waving Mexican flags... then they'd need even more. Is the levy inexhaustible? I think not. There is somewhere between 24 trillion rounds of ammunition in private (conservative hands) in America. Far more ammunition is sold to private buyers in the us every year than is sold to the government. Of passing note or of passing not... whatever... I clicked on one of those clickbait things at the bottom of a Fox News website about the "Beloved TV Shows Canceled in 2018". It showed me how out of touch I am, because I never saw any of them. I'd heard of a couple, but could never bother to sit and watch them. Not one. American culture has passed me by and I didn't even have the good grace to wave. There are something like 1000 channels of programming on TV between cable, Netflix, Hulu, Prime, etc. I can rarely find something that I actually want to sit down and watch. And when I do, it's almost always a disappointment. I find myself entertained more often by a book (bought electronically through Amazon.com on Kindle) that I read on my I-Pad. The greats, like Jim Curtis (Old NFO), are not writing enough so I have to find joy in other, lesser authors. It's the day for zombies, isn't it? My daughter had to take my granddaughters (left) to ballet class yesterday, the pre-zombie day, and this is what it looked like. 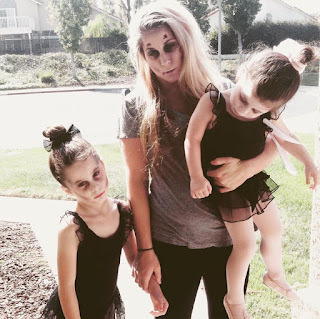 They are cute zombies. I find the zombie TV shows to be incredibly boring. Headshots of zombies, which promotes the video gaming industry in which teenage boys spend their afternoons shooting video zombies in the head. I guess it can pass for American culture can't it? And then there is the big ramp up for the candy harvest tonight. I opted for three Costco trick-or-treat bags of nearly full size candy bars, doing my best to support the dental industry and of course, candy manufacturers and retail outlets. Zombies on TV shows don't show any affinity for candy, but the crew who will come by the house tonight will doubtless break that mold. The three years of (marginally effective) bombing have destroyed what infrastructure Yemen had. Admittedly not much. A wholly predictable side effect of the war has been the breakdown of the public health system, the world’s worst cholera epidemic and half the population – about 14 million people – suffering from famine. Without the war there were about the same number of starving people (a statistic that the UN and other aid organizations never bother to disclose. Another push by the Saudis to liberate Hodeidah from Iranian proxies (Houthis) is imminent. A Yemeni official said the Saudi-led military coalition sent more than 10,000 new troops towards Hodeidah in preparation for a new assault. The new offensive is supposed to begin within days. A contingent of forces from Sudan recently arrived to secure areas already liberated and free up more experienced forces for use in another offensive. The last coalition push to capture the port was in mid-September. It made limited progress. Coalition forces have been trying to liberate Hodeidah for nearly a year. Last January, Virtual Mirage reported Emirati forces advancing on the port. Since then, the coalition has captured most of the coast between Aden and Hodeidah and the southern suburbs of the port. But the Houthis still hold the port. The US provides extensive assistance to the Saudi and UAE air forces (who write checks to pay for it), which fly sorties agains this or that target. It's said that the US could stop the bombing by refusing to send weapons, ammunition and spare parts to the Middle East, but "war is a racket" (GEN Smedley D. Butler) and by providing support to the Saudis and UAE, we fight a proxy war against Iran that petro-dollars pays for. When will it end? It started in 632 AD when Mohammed died and a family scuffle broke out over who got what spoils.